Part 2 of our New Paintball Guns, Gear & Rumors for World Cup features an update on the Luxe 1.5 and the EMPIRE AXE paintball guns. Check out Part 1 here. The DLX “Luxe 1.5” is set for release at PSP World Cup. This is a revision release based on feedback Darryl Trent collected from Luxe owners throughout the season. 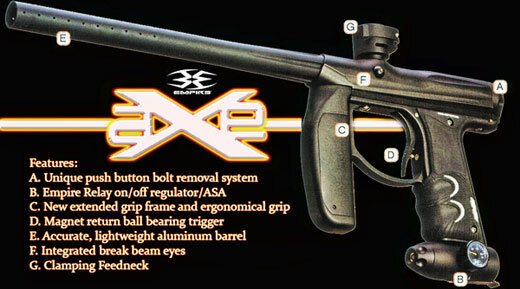 KEE Action Sports will be launching the new EMPIRE AXE paintball gun. We had the opportunity to check this gun out in person at the Paintball Extravaganza in September and were very impressed. The AXE is the 2nd generation of the Invert Mini and features numerous upgrades and improvements from its predecessor. Based on customer feedback, EMPIRE has equipped the AXE with an ASA (under the grip), tool-less bolt removal, and a larger area around the trigger and a quick change auto-cocker barrel. The EMPIRE Axe will have an MSRP of under $500.00. Stay tuned as PRO Paintball will be making a full review and evaluation of the new EMPIRE AXE paintball gun in the coming weeks. MacDev has refined their popular MacDev Clone paintball gun. The Clone VX features re-designed VX Drive, Feed system, Software, and Regulator. MacDev are pleased to announce the impending release of the new Clone VX marker. The Clone VX is a highly refined version of the successful Clone marker of 2009. MacDev design engineers have revised many aspects of the marker, making it even better than the original Clone model. “The Clone VX isn’t a crazy new invention. We haven’t reinvented the wheel. Just made it better, in essence the Clone VX is a revision giving the players what they have asked for after applying feedback for some of the top players in the world (Russian Legion, Syndicate, RNT etc).